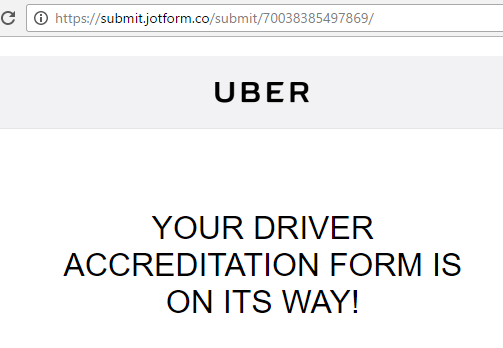 I am trying to fill out the Uber Driver accreditation form. I have filled this damn form in 30 times now. EVERY SINGLE LINE IS COMPLETE. I am computer literate and understand what I am doing. Most Uber driver are not. Please sort out this form, so a complete idiot can fill it in. I have tried submitting your JotForm and was able to submit it normally. It has displayed the Thank you message without any issue. Were you able to fix the issue? If you are still experiencing any issue with the form, please let us know. It would be helpful if you can provide us with the screenshot of the error so that we can take a look and provide you with necessary assistance. No matter what I do, I cannot submit the form. Does this mean you have submitted it and it is done ? Are you sure all fields was completed? If you sure this, I think it was a temporary issue and fixed now. Please try to replicate it and if you have got any problem, please let us know.